The following images are what you should see when you go to Index. Please find the corresponding number in order to recieve full details on what should or could be put in that field in order to make your page the best. 1. Title: You may not change the title for this page. 2. URL: This is the url in order to reach the page. Because this is a home page do not add or change. 3. Description: A description of the page in sentence form that helps with SEO. 4. Content: Any words or images entered into content will show up below the header image/rotator/video. This section is optional because it is possible to just use sections (13) to create your home page. 5. Keywords: A description of the page using words seperated by comas, this also helps with SEO. 6. Header Background Video: This is where to enter a background video. 7. Show in Navigation: Check this if you want the home page to be displayed in the Navigation. In order to change change the link in navigation from "Index" to something like "Home" you must change the label name in the navigation section. 8. Location: This cannot be changed in the home page. 9. Header Image: This is where to enter a header image. 10. Rotator: This is where to enter a rotator. 11: Template: While you can change the template, the Home Page template is created specifically for Index and should be kept as home page in order to utilize sections. 12. Sections: Sections are the best way to utilize your home page to make it both unique and informative. Sections 01-06: These sections can be changed around. It is recommended to fill these sections with the "Sections". Sidebar sections are not intended to be used for the front page. Other sections such as "Contact Us" or "Ministries" could be used, and is up to you how they look. Feel free to play around with the order and what sections are shown/not shown. Use the "edit section" to the right of the section to edit any information located within this section. 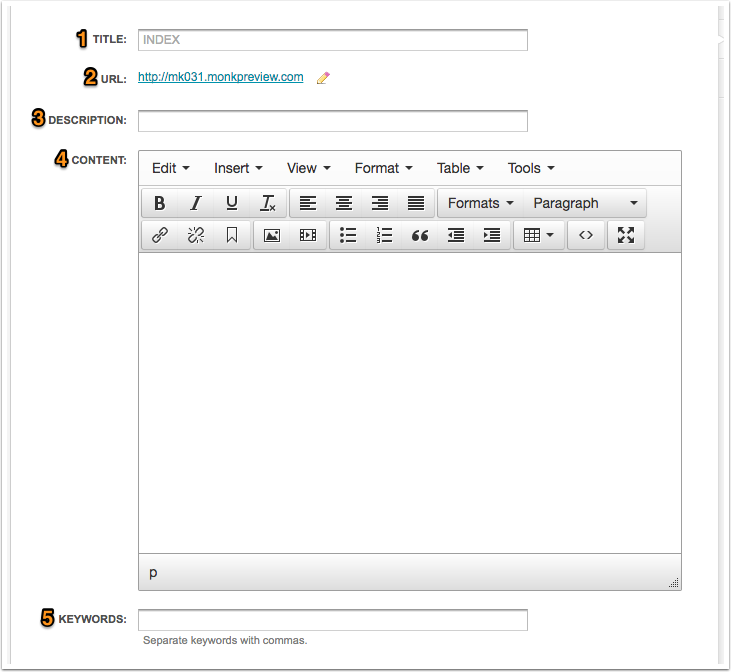 This allows for easy editing and navigation when working on the home page.